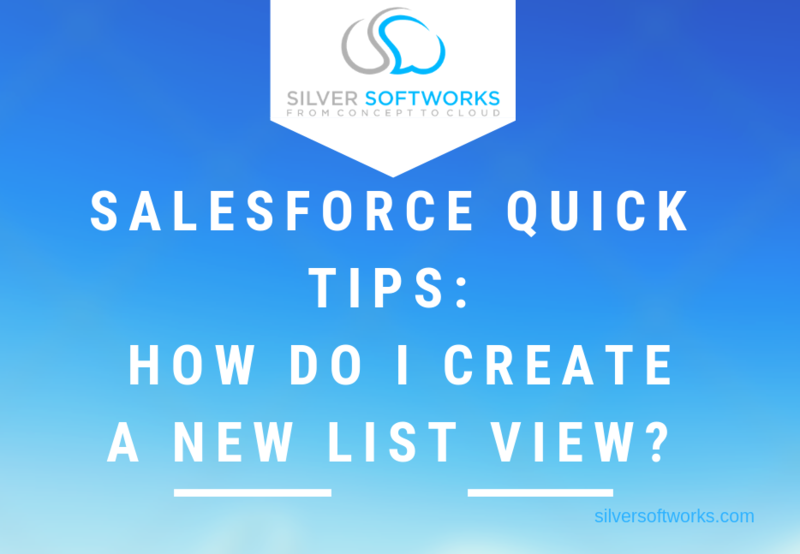 We get many frequent questions here at Silver Softworks, one of the most common being ‘How do I create a new list view?’. To help you out we have created this easy to follow short video and step by step. Firstly click on the opportunities tab. By default you will see the results listed as ‘Recently Viewed’, which may not be the desired view you are looking for or need. To fix this, click on the cog tool on the right hand side, this is your list view controls. Simply select ‘New’ and get creating. In this example we are creating a list view of all our open opportunities this month to determine what needs to be chased down the pipeline, however the same method is used for any other views you feel best suits your business. Start by giving the view a name in the ‘List Name’ box. Here we call ours ‘My Open Opportunities – This Month’, as long as it is clear and you know what it is, you are free to call this whatever you choose. Next is ‘List API Name’, This will be inputted for you based on the name you have given your list view. This is for the developer side and probably not important to you, meaning as long as this name is unique, you can more or less ignore this step. You are then met with one or two radio buttons asking ‘Who sees this list view?’, if you have the permissions, you are able to allow all users to see the list you are creating, however more often than not, the view will be set to ‘Only I can see this list view’. Click the ‘Save’ button at the bottom of the popup box to begin making changes to the list you have just created. Now you have your list, it’s time to set up filters to make the list easier to find what you need. These are over in a column in the right hand side, where you will see the first filter is already set for you. The filter will show your opportunities only, although if you wish to change this click on the box and change to ‘All opportunities’. Now you can begin adding some filters of your own. Click the ‘Add Filter’ button below the preset filter and change the dropdown boxes to whatever combination works best. Begin with choosing a ‘Field’ using the drop down arrow, here we chose ‘Close Date’. Next is the ‘Operator’ element, this should be a direction of whether you do or do not want it seen, here we leave it at ‘equals’ as we want the fields to match the value we will input. The ‘Value’ field is the only one the that needs manually inputting rather than options given to you. Here we have chosen ‘THIS MONTH’ in the example, as Salesforce will know what you mean even if specifics, such as dates in this case, are not entered. Simply click the ‘Done’ button in the bottom right of the popup box when you are happy with your filter. Using the same steps, you are able to create a number of variants, some such as the next example seen here will change some of the options given to you. By choosing ‘Closed’ in the ‘Field’ tab, the ‘Operator’ dropdown will be the same as previous, however this time the ‘Value’ option is now a selection of buttons. In this example we have chosen the ‘False’ option. Then click ‘Done’ as before. Once you have created all the filters you desire, click the ‘Save’ button at the top of the column to see the results of your filters. If you would like to further personalise your view, you are then able to change the headers at the tops of each columns to only see relevant data to what you need. Head over to the right hand side and choose the cog icon we used earlier to create our list. This time however, click on the ‘Select Fields to Display’ option in the drop down list. When the popup appears, switch the fields you wish to see from the ‘Available Fields’ column to the ‘Visible Fields’ and vice versa for those you do not wish to see. Once you have all the fields you want in your ‘Visible Fields’ column, you are the able to select which fields you deem most or least important and move them up and down the view, using the arrows to the right of the column. Once you are happy that all the fields are in their correct columns and order, simply hit save to see your personalised list view. You can then select the headings of each row to reorder, ascending or descending and your list view is now complete. If you would like to access the list view again it will appear in the drop down option on the opportunities tab under whichever name you chose to call your personalised list view. Follow these steps and you are able to create as many new list views as you see fit. Why not also check out some of our other quick tip posts here. If you have any different issues or you would like to find out about our support options, simply get in touch here.